Are you a company involved in door-to-door services or transporting multiple boxes? Or do you frequently need assistance in your shop, farm, or home moving about parts, parcels, sacks, or commodities? You can make the arduous job of lifting and moving objects less of a chore by using a 2 wheel dolly. How do you choose a hand truck or dolly? Here are some questions to guide you. How heavy are the objects that you usually transport? Choose the load capacity and frame material suited for your purpose. Dollies are described by their load capacity in pounds. Their frames are usually made of aluminum tubes, steel, or cast iron. Steel is ideal for heavy loads. It is resistant to fractures or bending, but it can be heavy, too. Frames made of aluminum will be lighter than those made of steel or cast iron, but not as durable. On what floor or ground conditions will you use the dolly? Well, it is used mostly on a rough or paved road? Do you intend to use it on stairs? Large, puncture-proof wheels will be more capable of negotiating uneven ground and for carrying heavy loads. If you’d need to maneuver around tight corners or curves, it would be best to pick one with 360-degree swivel casters. As mentioned earlier, some hand trucks are fitted with special wheels built for climbing stairs. Do you need to frequently bring a dolly with you? Some types are lightweight and foldable, making them suitable for travelers or delivery companies dealing with multiple light parcels or goods. What’s the shape of the objects you normally transport? For the usual boxes and crates, hand trucks with the more common rigid backrest will do. For cylindrical loads like kegs and buckets, however, one with a curved backrest will be more like it. It will have chains or straps to keep the cargo steady and safe. How large are your usual cargos? Remember that the hand truck has two wheels only, so keeping the balance is vital. The ledge must not be shorter than 1/3 of the load’s length. For transporting large, heavy or delicate appliances, such as a refrigerator, use a 4-wheeled appliance dolly or a heavy-duty convertible. What types of 2-wheel dollies are there? Two wheel dollies have become very popular for countless applications. For that reason, we now see various types, make, and innovations depending on the intended use and market. What we’ve described so far is the standard 2-wheel L-framed dolly. Most farm, business, or homeowners buy it as their all-purpose utility cart for items weighing less than 600 lb. An aluminum construction is ideal for this purpose. This is the tougher version of the standard type and is necessarily made of steel or a combination of steel and other sturdy materials. It is designed for loads beyond 600 lb. 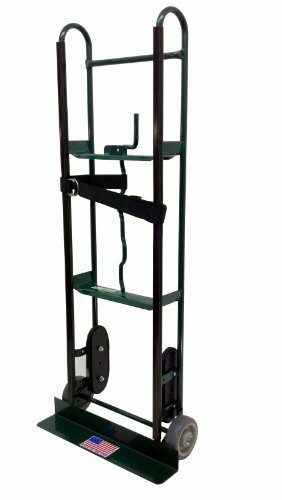 In this website, you will find industrial hand truck models with up to 1500-lb capability for moving trees and similar loads. This type is handy for people who cart small items from their car to several distribution points. Foldable dollies are ideal as a personal trolley cart for carrying grocery items, laundry, books, and garden tools. It usually has a capacity of less than 300 lb. It folds neatly for storage. These trucks have an extra pair of smaller wheels that convert the upright L-frame to a horizontal four-wheel platform for bulkier cargoes. Convertibles normally have capacities within the 600-1000 pound range with puncture-proof wheels up to 10” in diameter. Technically, this hand truck has 6 wheels but works on a single axle, much the same way as the 2-wheel hand truck. What’s unique about it is that its specially configured pair of tri-wheels enables the hand truck to climb stairs. We have a wide selection of stair climbers, which includes a heavy-duty steel-frame appliance dolly and several lightweight shopping hand carts. What’s a 2 wheel dolly? 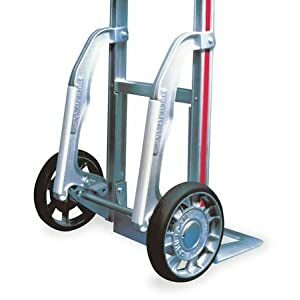 A 2 wheel dolly also goes by the name of a hand truck, stack truck, sack truck, handcart, box cart, two-wheeler, utility dolly, or sack barrow. It has an L frame with two wheels at the base. The frame’s long side is the backrest, and on its upper end is the handle. The short side is the ledge or nose where you set the load on. Why do you need a hand truck or dolly? It makes transporting so much faster than if you were to carry the load from point A to B yourself. Loading an object can even be done hands-free with this L-shaped equipment. Just shove the ledge underneath the object that you need to transport, and, voila, it’s loaded! With a hand truck, it’s practically possible to pick your cargo up without lifting a finger! Now, by tilting back the dolly, you are in effect distributing the load’s weight on the backrest and transferring it to the axle and the wheels. With a little nudge here and a push there, this simple machine makes moving heavy objects a minor task. What I’m saying here is that, with a hand truck, you’d get to win against gravity and friction any day you choose. There’s only one thing to remember when buying a 2-wheel dolly: It has to match the load you have in mind for it. Check its design specifications to ensure safety and maneuverability. Our website provides the description of each featured product, manufacturer details, and user reviews. Whether you’re moving stacks of boxes, cases, luggage, small appliances, car parts, or other objects, you’ll need a dolly. The best thing about it is that it takes the weight off your back (or your employees’). Not only that, you’ll see less of the long face that ordinarily comes with the task.